The patient-physician relationship is one built on trust. Physicians will advise patients of treatment options and patients will weigh their own preferences and thoughts against the physician’s recommendations. If you trust your physician, you probably will follow their recommendations more frequently; if you do not trust them, you may side with your gut instinct more often. How is trust built? This is a complicated question beyond the scope of this post, but perhaps having a physician of similar background (e.g., gender, age, race) builds trust. To test whether race plays a role, a paper by Alsan, Garrick and Grazini (2018) conducted a randomized controlled trial of over 1000 black men in Oakland, California. These men filled out a health questionnaire and were given a coupon for a free health screening at a clinic set up for the experiment. The participants decided to be screened were randomly assigned to a black or non-black physician. Did race make a difference? While this experiment is interesting, it is limited. It says that race matters in building trust with new physicians. 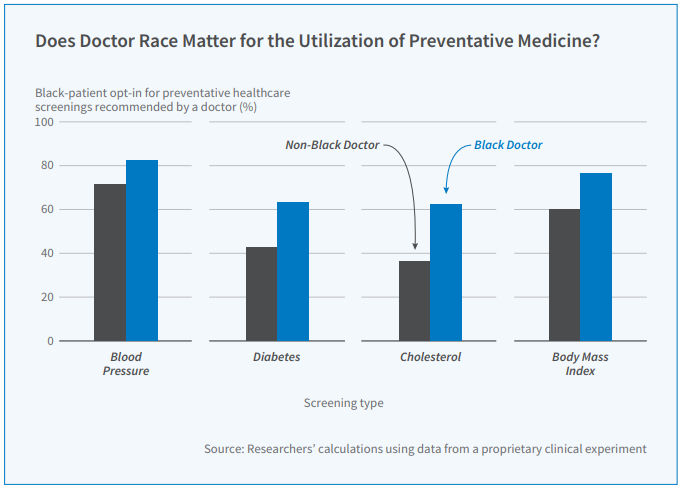 A potentially more relevant study would look at whether after a patient went to a physician a number of times, were their differences in screening rates by the race of the physician. My guess would be that the differences in screening rates between individuals with black and non-black physicians would narrow over time as trust is built with the individual physician. Would repeated interaction lead to an equivalent level of trust (and subsequent screening rates) regardless of the race of the physician or would race still matter? That is a question for future research. Alsan, Marcella, Owen Garrick, and Grant C. Graziani. Does diversity matter for health? Experimental evidence from Oakland. No. w24787. National Bureau of Economic Research, 2018. NBER Aging and Health Digest, 2018, vol 4.